University of Minnesota electrical and computer engineering researchers have created a magnetic tunnel junction that can be switched by a pulse of light lasting one trillionth of a second—a new record. The magnetic tunnel junction is critical to information technology advances with the termination of Moore's law, a principle that has ruled the microelectronics industry for five decades. 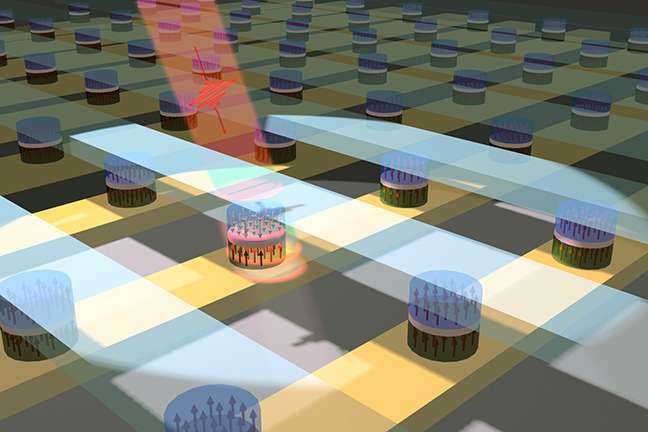 This advancement holds promise for the development of new, optically controlled, ultrafast magnetic devices collectively called spintronics (electronics that combine optical and magnetic nanotechnologies). These devices could lead to innovations in the storage, processing, and communication of information. An example of such innovation would be the development of a system that, like the human brain, can both store and analyze a large amount of data simultaneously.The details of the device and the tests conducted on it are reported in a paper published recently in Physical Review Applied, a journal of the American Physical Society. The ultimate goal for the research team is to shrink the size of the magnetic tunnel junction to less than 100 nanometers and reduce the required optical energy. To this end, the team is continuing its research, and is currently engaged in optimizing the material and structure of the device, and working on integrating it with nanophotonics.In addition to Li and Wang, postdoctoral associate Junyang Chen, and graduate student Li He are lead authors of the paper.